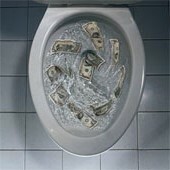 Tired of your money going down the drain? These plumbing tips will help put the cash back in your pocket.Money is a terrible thing to waste. You can find ways to save yourself from unnecessary expenses and that is a noble goal. Remember friends, home repairs can become costly, but planning ahead and finding trouble BEFORE it starts will pay big dividends. Regular maintenance and upkeep will help ensure that you keep your systems running well. You can start by accessing what plumbing areas might need some special attention. Learn more ways to save by going green. Surprises can sometimes be great, but not if it's an expensive plumbing bill from your favorite plumber. He may become your best friend though when he or she comes to the rescue. Check out these plumbing tips and helpful hints to reduce your outflow for household expenses. Check if your water bill has been increasing over time. You can also have a plumber come out and do a maintenance check each year. This can help you save money if you don't want to be bothered with the time and effort to maintain you plumbing yourself. Go over these plumbing tips and check to see if they can help you locate any problems. Be diligent to take care of problems right away so they don't create more headaches down the road. If all looks good then put it on your calendar to check again over the next 6 -12 months. If you notice any signs of leaks or decreased water pressure in the meantime, check again. Note anything that is a potential problem and schedule a time to maintain it or call your plumber out to check it. Regular maintenance is necessary to continue to keep your plumbing in good shape for many years to come. Spot possible plumbing leaks BEFORE they become plumbing repairs. Reduce trip fees by checking everything that needs serviced. Then call the plumber out for one trip. Learn how to do some simple repairs yourself. Use Licensed, Qualified, Professional Plumbers for needed repairwork. Unlicensed contractors may cost you more in the long run and you will have no recourse if the job is not done right. Take advantage of discounts and specials offered by reputable service providers. Use these cost saving tips to save yourself some hard earned cash and keep your plumbing running smoothly and leak free. Remember, getting expert advice before tackling a project on your own is the smart thing to do. A website of free tips and ideas for all your Do-It-Yourself projects. Here you'll find lots of things for the homeowner to save money and increase the value of your home!